Account options let you control various aspects of a user signing up for accounts. Both the account page created in wordpress as well as the customer checkout page let the user create accounts and these settings adjust how that process looks. Require Terms Agreement (Enable for GDPR Compliance) – Turn this on to establish a terms agreement when users create accounts. This way users agree to your terms with their account rather than per order. You must state all of your GDPR compliance information in your terms and have your policies established in order to follow GDPR. Collect Billing Information on Registration: You can enable this and require users to input billing address information when they sign up for an account. During checkout this is automatic, but if they visit the ‘account’ page, you can require it there as well. Enable Email Validation: If you receive a lot of spam account sign-ups, you may enable email validation which sends an email to the user after they create the account and they must activate it with that link in the email. 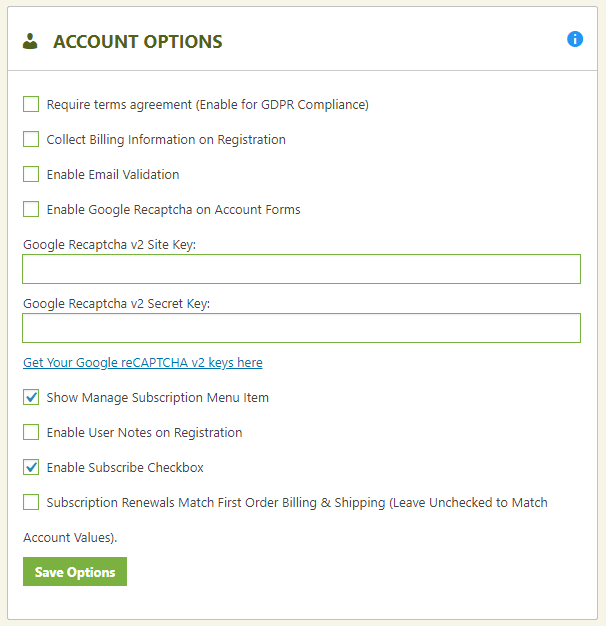 Enable Google Recaptcha on Account Forms: The recaptcha system allows you to enable googles v2 captcha system when users go to the account area to create a new account or sign-in. This does not appear during checkout as users are going to verify they are shoppers by purchasing, but to avoid spam in your account area, you may enable the recaptcha system. There is a link provided to go to google to create the simple 2 key system. Show Manage Subscription Menu Item: Not all stores have subscriptions, so you can enable this or disable this from appearing in the customers ‘account’ main menu section. Enable User Notes on Registration: The user may leave notes in an open text area if enabled. Enable Subscribe Checkbox: If enabled, the users name and email will be collected in the subscribe system. This is especially useful if you connect to MyMail Newsletter or MailChimp email services to send your subscribers news related emails, promotional emails, etc. Subscription Renewals Match First order Billing & Shipping: This setting allows you to control subscription billing & address information during renewals. Checking this option will mean the first order address are used. Unchecking will use whatever values the actual account on file addresses are.